I think you have to look very carefully at the kind of psychological profiling you are attempting to do. I have seen some situations where that’s done poorly and actually can make things worse. I think, overall, it’s probably the right thing to do and there were certainly discussions with my colleagues nationally that that will be a more nationally prescribed process in 2019, so building on some of the work the dioceses are doing, so I think it has got a place when it’s done well. It is curious that this news follows yesterday’s post on the scriptural qualifications for church leadership. It really ought to be a question of (‘simply’) distilling what the Bible says about the qualifications and characteristics of a church leader, and thereafter discerning vocation. The moment you incorporate mandatory psychological profiling, you run the risk of limiting the operation of spiritual gifts in the Body of Christ. No doubt psychological profiling will enable diocesan directors of ordinands and Bishops’ Advisory Panels to spot those who are compassionate, pastoral and mutually relational. This is good, for the Church needs pastors. But it also needs teachers and prophets, and these can be spiky people, apparently self-absorbed, impatient, inclined toward self-righteousness, judgmental and lacking theological imagination. They might be judged authoritarian, lovers of power (or their own voices), divisive and intolerant. What Bishops’ Advisory Panel is going to advance someone for ordination who manifests prophetic vision over managerial skills? There is a profound danger – in the fraught reputational context of Safeguarding and the race to be seen to be ever holier and even whiter – that the discernment of vocation becomes motivated by fear rather than faith. Children have been sexually and psychologically abused, so let’s weed out all those who manifest the inclination toward the abuse of power; those who struggle with submission to authority; those who believe they exercise a ministry of truth-telling and communicating a ‘God’s-eye point of view’. For such men (and they will invariably be men) are undesirable moralists, steeped in an ideology of rightness with a posturing of certitude that absolutises spiritual ideas and theological abstractions rather than fostering actual warm, loving, compassionate relationships. Such men preach about love in place of the act of love: judgment-love is seen to supplant justice-love. Such men, when they come forward for ordination, will be seen as possessing an ethical duty to make others see things their way – whether politically, morally or theologically. They will quite probably love and be loved just as well as any potential ordinand, but their warm, loving compassionate relationships will be judged to be based upon potential imbalances of power and psychological manipulation, from which there will be no appeal. The Church of England might as well delegate its discernment of vocations to Cambridge Analytica. It seems that when psychological profiling is carried out for Donald Trump (or Vote Leave), it is a tool of great evil, but when the psychological profiling is carried out for Barack Obama (or pro-EU), it is “harvesting the power of friendship“, which is a work of great and godly virtue. What a wonderful way of effecting social and political transformation. When psychological profiling is exercised by the loving liberal left, it is a wellspring of justice and hope, but when it’s in the hands of the intolerant religious right, it brings division, violence and bloodshed. Not all are called to be poets and pastors, holy and devout, wrapped in gentleness and meekness. Some are called to be radical and bold, which (in the contemporary context) might easily be mistaken for arrogance, ignorance or ‘hate’. One man’s passion is another man’s offence. 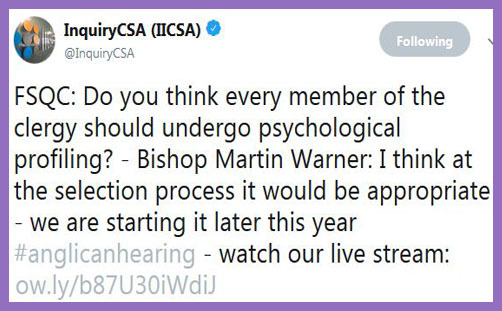 Psychological profiling might have a role in character analysis, but equally might it become the tool by which the Church of England weeds out those who are right.